Pic the Gift announces the latest addition to their online store, photo pillows that you can completely customize to your liking. These custom photo pillows can be a great addition to any couch or bed. They are a terrific idea for a wedding gift, birthday gift, baby showers, and more. Pic the Gift has added yet another product to their ever growing product inventory. Their new custom photo pillows are completely customizable with any photo, image, design, or even text you would like. 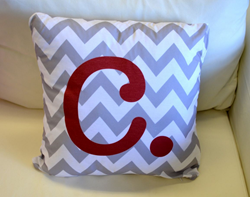 The pillow is 18x18", allows for optional pillow inserts and can be customized on both sides. These custom photo pillows can be a great addition to any couch or bed. They are a terrific idea for a wedding gift, birthday gift, baby showers, and more. Pic the Gift's customization tool allows you to choose whichever photo, image, design, or text you would like on your pillow while also allowing for customization on both sides so you can create something that is both eye catching and memorable. The pillow also comes with an invisible zipper on the bottom so it is well hidden and will not distract from your beautiful creation. Established due to the rising demand of customized products and photo gifts, Pic the Gift established themselves as an American made manufacturer who prides themselves on maintaining strict quality standards while having 100 percent of their manufacturing done in the United States. Located in St. Louis, Missouri, they offer expedited delivery to each of their clients and can ship anywhere in the United States within 4 days. With over 50 years of experience in the distribution and manufacturing of custom gifts, Pic the Gift's goal is to to create an easier, user friendly experience for of all their customers.